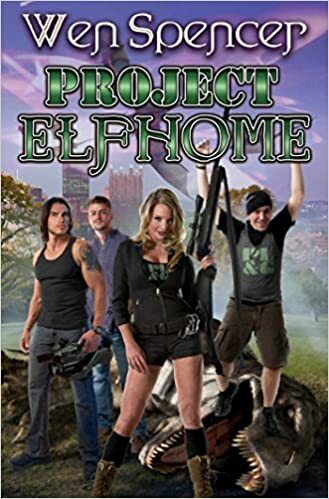 Description: Stories exploring the fascinating realm of Elfhome, a world where modern day Pittsburgh has collided with the kingdom of the Elves. A special entry in the the best-selling Romantic Times Sapphire award winning Elfhome series. Contains some of Wen Spencer's best shorter works including gems "Bare Snow Falling on Fairywood," "Pittsburgh Backyard and Garden," "Peace Offering,” and more tales set in the world of best-selling Elfhome series entries Tinker, Wolf Who Rules, Elfhome, and Wood Sprites! Pittsburgh: a sprawling modern Earth city stranded in the heart of a virgin forest on Elfhome. Sixty thousand humans, twenty thousand black-winged tengu, ten thousand elves, an unknown number of invading oni, four unborn siblings of an elf princess, three dragons, and a pair of nine-year-old geniuses. My Thoughts: This is a set of interconnected stories which highlight characters who are not the main characters in the rest of the Elfhome series. The three main characters around whom the stories revolve are all human women. Law and Jane were born in Pittsburgh and have grown up with it being part of Elfhome. Olivia is a sixteen-year-old runaway from Earth who is trying to get as far away from her abusive husband as possible. Some of the main characters from the other books make brief appearances in this book but the main focus is on how "ordinary" humans are dealing with the war between the elves and the oni and dealing with the fact that Tinker has cut the gate back to Earth. Law's part of the book talks about someone who is a forager with a strong hero complex who finds herself rescuing a young elf who has no clan ties to anyone in this part of Elfhome. She has been rejected by all the clans there. Jane's part of the book was the funniest. She is the producer for Pittsburgh's version of a home gardening show. Only plants on Elfhome are much more dangerous than any Earth plants. Jane is in charge of keeping the accident-prone start of the show from doing anything too extreme. She is also put in charge of baby-sitting a new crew from Earth who wants to make a show about the dangerous animals living there. Of course, she is also looking for her young sister who disappeared when she was six. Olivia has run to Elfhome to escape her abusive husband and the religious cult that she was living in. She's pregnant, there illegally, and searching for a way to make a place for herself. When she learns that there is an insane elf who needs a domi she decides that becoming his will make a place for herself in this new world. I liked the way all the stories were woven together to make a cohesive whole. I also liked the author's notes at the end that told how she came to write each story. Fans of the Elfhome series won't want to miss this fascinating new glimpse into the world of Elfhome. Law was not one to give credit to rumors. People liked to talk. Just because they ran out of facts didn't stop the mouth from flapping. I got this one in exchange for an honest review from Baen Books via Edelweiss. You can buy your copy here.